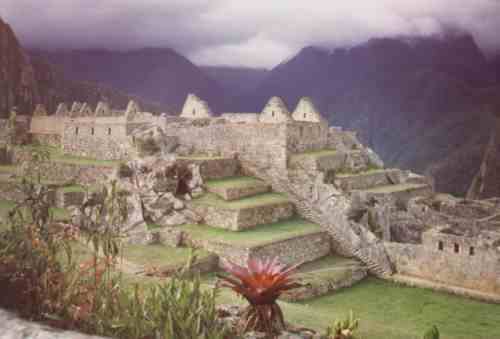 The American professor Hiram Bingham searched already some time for the lost city of Vilcabamba. This was the last hiding place of the Incas. 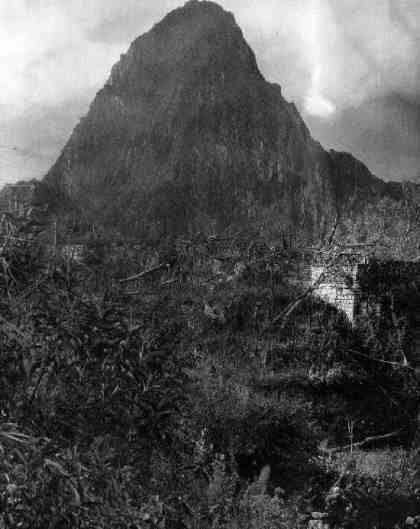 On July the 23rd of 1911 he and his team were again deep in the Andes looking for Vilcabamba. He relied on cryptic indications in an old document about the last free Inca Manco Capac II who escaped from the Spanish after the defeated revolt in Cusco. The weather was very bad, but an innkeeper fanned the interest of the professor telling a story about a lost city in the neighborhood. He and his team stayed in the humble hotel of the innkeeper who was promised a silver dollar if he could bring the team on location. On the 24th of July Bingham went together with the innkeeper and a representative from the Peruvian government facing the bad weather, gray clouds and tropical rains. The other members of the team choose to stay in the hotel and wash their clothes. The professor and the two fellow passengers had to cross the wild Vilcanota River by a wooden bridge and climbed 600m on a very steep mountain. Halfway the mountain the guide talked with the owner of a simple hut with a thatched roof. Bingham wanted to continue and a 10-year-old boy guided him. 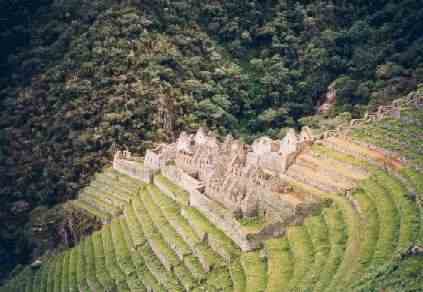 They had to climb over Inca terraces and a little later his encouragement was finally rewarded. He stood before the walls of Machu Picchu. The picture on the left-hand side is the first ever taken from the Sacred City. The tropical vegetation was ranked over the ruins totally, but the remains were pretty good preserved. In the next years of investigation Bingham took about 11.000 (!) pictures from the complex. In his book "The discovery of Machu Picchu" he later wrote: " Suddenly I was standing in front of the walls of a ruin and houses from the best quality of Inca building art. The walls were difficult to see because the trees and moss ranked partly the stones during centuries. But in the shade of bamboo bushes and climbing plants were the walls visible of white granite blocks chopped in the highest precision. I found brilliant temples, royal houses, a big square and tens of houses. It looked like a dream. " Machu Picchu is situated between steep mountains with summits above 5.500m and the always-wild Vilcanota River. The only way to get there was over a narrow footpath constructed by the Incas, the Inca Trail or the Camino del Inca. Today thousands of tourists come by train to visit the Sacred City. The visitors get of the train in Aquas Calientes and take a bus to the ruins. The city of Machu Picchu is located at 2.400m above sea level and a 100km from Cusco. Lots of visitors still arrive in the sacred city by the Inca Trail. There are trails from 2 to 9 days; the most common are the 2-days and the 4-days trail. You have to have a good physical condition. The second day of the trail crosses a pass of 4.300m with views on glaciers, white summits and the mystical subtropical forest. On the four-day trail various ruins can be seen and the guide will explain with a charming pride what these places represented in the empire of the Incas, Tahuantinsuyu. Left is the ruin of Wi�awa�a where the Inca Trail passes the day before arriving in Machu Picchu. The Sacred City is situated on the other side of the mountain. More details of how to get there and what you need in the Machu Picchu section of Cusco. The Sacred City is built between two sharp peaks, in south the Machu Picchu (Old Mountain) and north the lower Huayna Picchu (Young Mountain). 800m below twists the Urubamba (or the Vilcanota River) through the 90� steep rock walls. The vegetation is the beautiful subtropical rainforest. All of this combined with the surrealistic beauty of the city of Machu Picchu makes this place one of the most beautiful on earth. This place is just amazing. I was there in 2006 and will be back in Peru this week for another holiday. I hope one day to live in Peru. My wish is to help out at one of the orphanages. Is it a good idea to get rabies shots before going? the pg. is really informative...i learned a lot just looking at the pictures....maybe i'll go there someday. It would be nice to have the calendar year of special dates celebrated in Cusco and Machu Picchu, such as Inti Raymi. 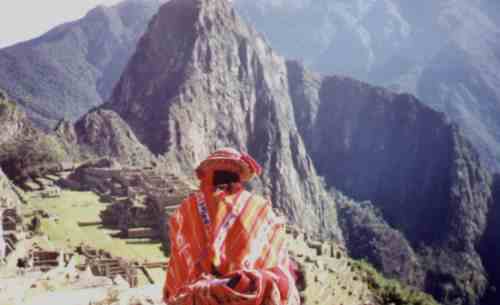 These dates are a big factor for tourist to decide which month of the year is more interesting to visit Machu Picchu. This page is AWESOME! I dream of visiting such a brillant exotic place. Great!